Introduction: The needlescopic laparoscopic procedures provide minimal scars, minimal tissue injury, probably less postoperative pain, and analogous to conventional laparoscopic approach postoperative results in selected patients with acute abdomen. 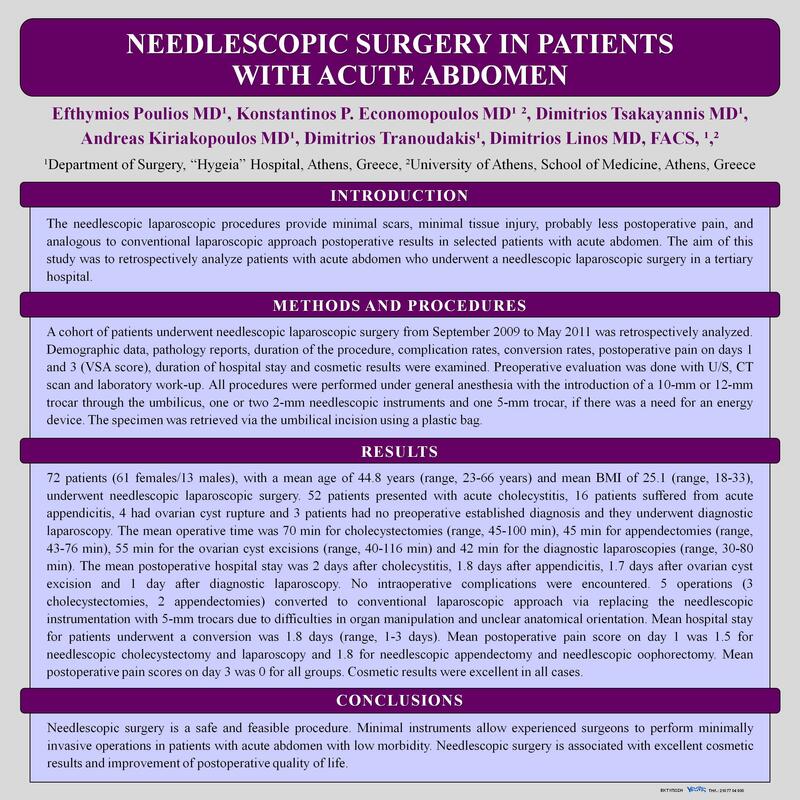 The aim of this study was to retrospectively analyze patients with acute abdomen who underwent a needlescopic laparoscopic surgery in a tertiary hospital. Methods and Procedures: A cohort of patients underwent needlescopic laparoscopic surgery from September 2009 to May 2011 was retrospectively analyzed. Demographic data, pathology reports, duration of the procedure, complication rates, conversion rates, postoperative pain on days 1 and 3 (VSA score), duration of hospital stay and cosmetic results were examined. Preoperative evaluation was done with U/S, CT scan and laboratory work-up. All procedures were performed under general anesthesia with the introduction of a 10-mm or 12-mm trocar through the umbilicus, one or two 2-mm needlescopic instruments and one 5-mm trocar, if there was a need for an energy device. The specimen was retrieved via the umbilical incision using a plastic bag. Results: 72 patients (61 females/13 males), with a mean age of 44.8 years (range, 23-66 years) and mean BMI of 25.1 (range, 18-33), underwent needlescopic laparoscopic surgery. 52 patients presented with acute cholecystitis, 16 patients suffered from acute appendicitis, 4 had ovarian cyst rupture and 3 patients had no preoperative established diagnosis and they underwent diagnostic laparoscopy. The mean operative time was 70 min for cholecystectomies (range, 45-100 min), 45 min for appendectomies (range, 43-76 min), 55 min for the ovarian cyst excisions (range, 40-116 min) and 42 min for the diagnostic laparoscopies (range, 30-80 min). The mean postoperative hospital stay was 2 days after cholecystitis, 1.8 days after appendicitis, 1.7 days after ovarian cyst excision and 1 day after diagnostic laparoscopy. No intraoperative complications were encountered. 5 operations (3 cholecystectomies, 2 appendectomies) converted to conventional laparoscopic approach via replacing the needlescopic instrumentation with 5-mm trocars due to difficulties in organ manipulation and unclear anatomical orientation. Mean hospital stay for patients underwent a conversion was 1.8 days (range, 1-3 days). Mean postoperative pain score on day 1 was 1.5 for needlescopic cholecystectomy and laparoscopy and 1.8 for needlescopic appendectomy and needlescopic oophorectomy. Mean postoperative pain scores on day 3 was 0 for all groups. Cosmetic results were excellent in all cases. Conclusions: Needlescopic surgery is a safe and feasible procedure. Minimal instruments allow experienced surgeons to perform minimally invasive operations in patients with acute abdomen with low morbidity. Needlescopic surgery is associated with excellent cosmetic results and improvement of postoperative quality of life.